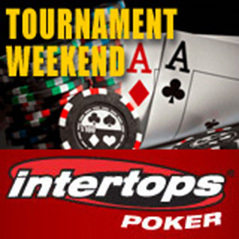 If you like your poker with four hole cards rather then two then Intertops Poker is the place to be this weekend as the site is running a trio of special, small buy-in PLO tournaments throughout the weekend with $1,000 to be won. The action starts tonight at 5.59pm ET with a $2 tournament with $200 to be won. There's $500 on offer in a $3 event at 4.59pm tomorrow with $500 up for grabs for the princely sum of $5 at 4.59pm on Sunday. New players can take part in the PLO weekend with a 200% welcome bonus of up to $2,000. Open an account Intertops Poker.